5.5 hours; 2 hours from Tung Chung to Sham Wat village, 45 minutes Sham Wat to stream. 2.5 hours in stream. 15 minutes from stream to Ngong Ping. Transportation: Start at Tung Chung MTR, Exit A. Return via bus 23 at Ngong Ping, to Tung Chung. Last bus at 19:10! Tung Chung MTR Exit A. 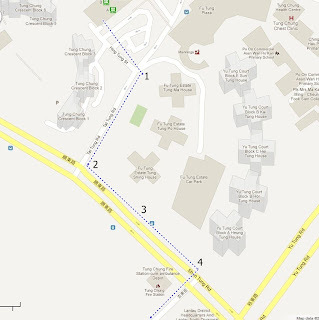 Cross all the cab stops towards the apartment towers in front of Exit A. Refer to Point 1 on the map. 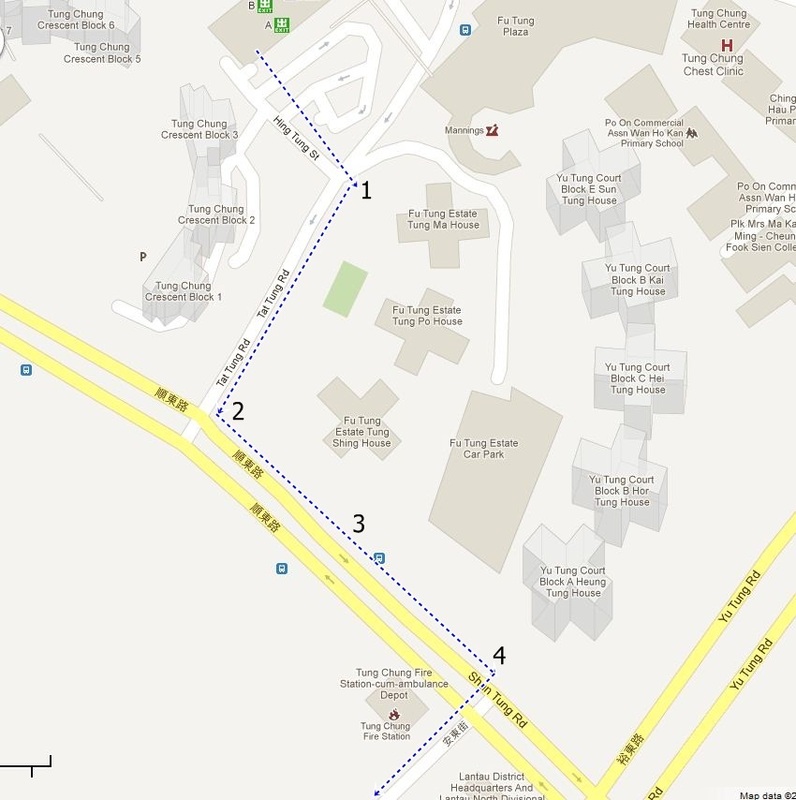 You will be on a path that parallels Tai Tung Road until it reaches Shun Tung Road. Do not turn right into the tunnel, instead, turn left. After about 100 meters, there will be a tunnel on your right. Take it. Bunch of steps right in front of you. Don't take them, follow the path on the left. After the tunnel, walk about 200 meters and take the catwalk over Chung Yan Road. Keep walking for another 200 meters or so, you'll go past housing estates on your right and get to another catwalk. Don't take that one, just keep going straight. Just before the end of Tu Yung Road, you will turn right at a sign post indicating the way to Hau Wong temple. Down the stairs, turn left. In general, just follow the signs indicating Tai O. About 1 kilometer in, in a small village. Just added this one because it may be confusing. But again, just follow the signs that indicate Tai O. From this point on, in it smooth walking without real possibilities of a wrong turn until Sham Wat Wan, 9 kilometers along the way. Sham Wat Wan. The ladies there at the village will surely remind you that there's food to be had if you are hungry. If you don't plan to stop, keep walking on the road through the village and over the bridge. ...don't miss that turn on the left. The sign reads 'Sham Wat Catchwater (East)'. 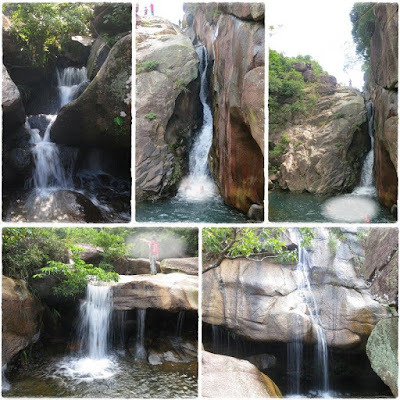 Nei Ngong waterfall (彌昂飛瀑). Bypass on the left. If at any point, the climb looks too difficult, chances are that there's a ribbon delimited bypass. The spot where we exited the stream. I put some blue ribbons on the right to indicate the path. The path itself is quite well-used so if it is not too late in the evening, you should find it easily. Remember, it's on the right. At Tai Shui Hang MTR, take exit B. And then head left (North) following Hang Tak street. Until you reach this point, about 100-150m in. Take the road on the right. Bushwack your way, following the trail to the water. Head left towards the other dam and bridge. ... the stream entrance is right there. Hero's cliff. Magnificent waterfall. Nice place for a picnic and a swim. Keep going. 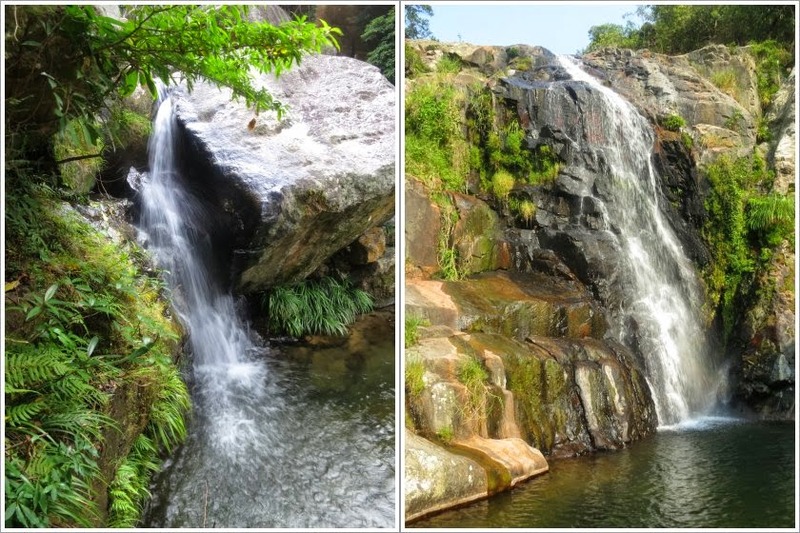 No significant waterfalls afterwards but at one point, you'll hit a fork, head left and there will be a bridge-like thing. Head left. Now, you will know you went on the wrong side of the fork ("Use the fork Luke!") if you arrive at the dam on the right on the picture. Just retrace your steps to the fork and head left and out of the stream. The stream portion is over, you are about 50 minutes away from the MTR. You'll eventually get to this farm. Go through on the left. Be respectful of private property. 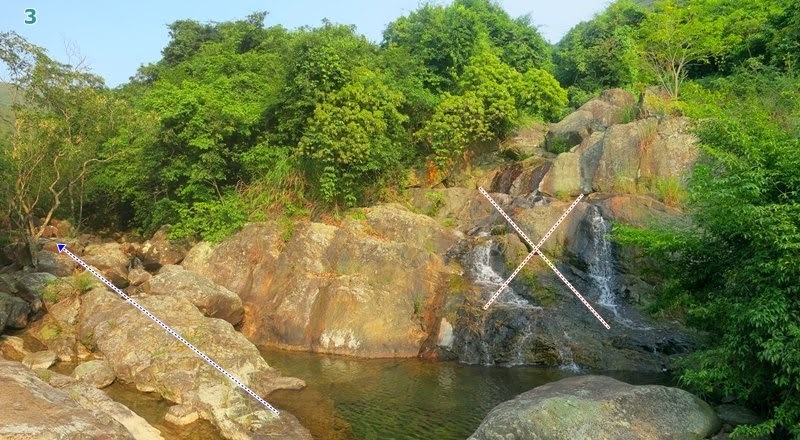 As you get out of the village/farm, you'll hit Man On Shan Country Trail, head left. You'll get to the pic-nic area where there are toilets if you need a pit-stop. Otherwise, keep going on the Man On Shan Tsuen road. At one point, you'll see a hole in the fence on your left, next to a concrete structure, that's a shortcut, go through and go down the steep path. About a hundred meters onto the trail, there's a shortcut path on the right. Take it. You'll get to the road. Head left. Then connecting to another road and sidewalk. Head right. Through the garden. Admire the Chinese "bas-relief"
You'll end-up at Hang On MTR station. Quite a nice stream, isn't it?